The study of users’ emotional behavior as an important aspect of the user experience has been receiving increasing attention for the past few years. 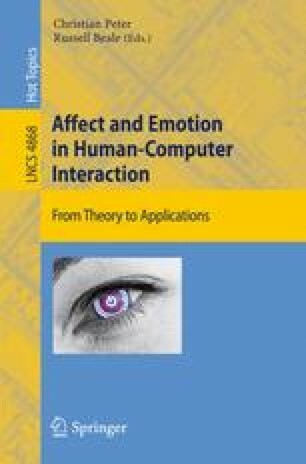 In this paper we discuss the multi-component character of emotions and its consideration in the area of human-technology interaction. Based on the approach proposed by Scherer , various aspects of emotions were investigated in an interactive context: subjective feelings, physiological activation, motor expression, cognitive appraisals, and behavioral tendencies. In an experiment emotion-related changes were detected for a number of emo tional components by using a variety of methods: rating scales for sub jec tive feelings, electromyography of facial muscles, heart rate, electrodermal activity, perfor mance data and questionnaires on cognitive appraisals. Results are discussed with respect to the correlation between the components and their associated methods. We suggest that a combination of methods provides a comprehensive basis for analyzing emotions as an aspect of the user experience.